Best-selling author Ann Handley has the secret to level-up your writing skills. She shared it at Content Marketing World. Now, I share it with you. Many of us might think that the secret to becoming a “ludicrously spectacular” writer is magic. Or an innate talent or gift. But Ann gave us the cold reality: To be a better writer requires showing up every day and doing the work. And with that realization understood, she took off to reveal the five levels of her writing pyramid and some tools to help along the way. The level that should consume most of your time doesn’t look anything like writing. Yes, the foundation of good writing is not writing but thinking and researching. At this stage, you embrace the writer’s spirit animal — the squirrel. You are a scatter-hoarder, collecting ideas like acorns and saving them in various places — digital and physical. Then, you take the idea and research “the daylights out of it,” using Google, including its Books and Scholar options, and other available tools. I’m just making a list of key points. I’m only outlining my ideas. Or record your thoughts and then transcribe them. Find what works for you and, sooner rather than later, that blinking cursor will be farther down the screen. If your inner critic is loud, muzzle it with a distraction-free writing tool. While Ann lists a bunch in her book Everybody Writes, three of her favorites are Draft, OmmWriter, and Ulysses. The main idea here is to stifle your inner critic and your inner editor; instead, just get a bunch of ideas and words on the page in whatever way you’re able. 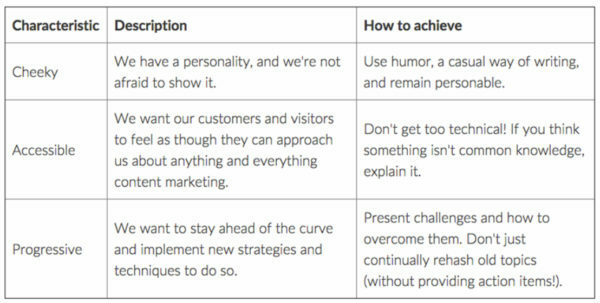 Always ask (and answer) what’s in it for your audience — that’s the gateway to pathological empathy for your reader. Self-edit by chainsaw — make each paragraph earn its keep. Self-edit by surgical tools — make each sentence earn its keep. Self-edit for voice — make sure the text sounds like a real person with a point of view (more on this in Level 5). Ann confessed that she obsesses more about the first line than anything else in her content, including the headline. The first line either makes people want to read further or stop reading right then. Remember, readers are looking for reasons NOT to read your content. Though we read in silence, we hear the words in our heads and form opinions. We listen to decide if they resonate. Your voice is what separates your content from your competitors. Think of it this way, if you took your brand label off your content, would you know it was your content? Would your clients know? What are you like to deal with? Uberflip also has a well-detailed style guide. Ann encourages all to steal from it to create their own brand style guide. I will collect and hoard five ideas a day. I will not hit the backspace while I’m writing. I will not go straight from writing to publishing. I will have pathological empathy for the reader. I will not sound like everyone else. Are you ready to do the work every day? 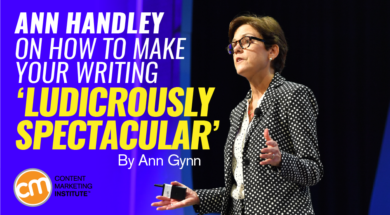 If so, make sure to block out Sept. 5-8 — take a break from the daily writing work and learn a lot at Content Marketing World in Cleveland, Ohio, and hear what Ann Handley has to say in September 2017. Use code BLOG100 to save $100 on early-bird pricing. Register today!